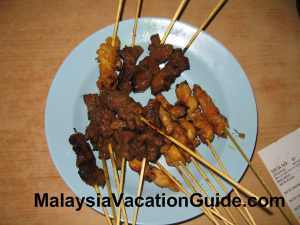 If you are in Klang, you may want to consider trying a few Klang food outlets which have been around for many years and even decades. 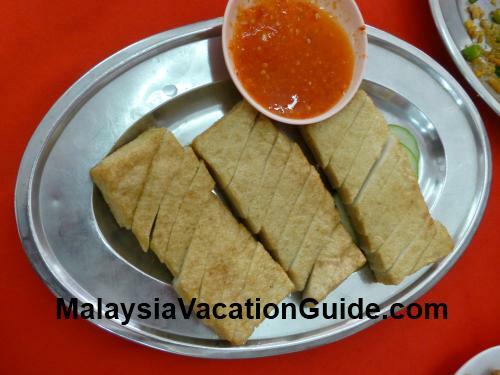 The typical traditional breakfast that people from Klang take everyday is toasted bread with coffee or bak kut teh. The demand for food throughout the day has caused the shop owners to also operate many of these food stalls throughout the day. Hence, you can take toasted bread or bak kut teh at anytime of the day. Here are some of the restaurants that you may want to go to while you are here. Mee Hoon Kuih is made from flour and usually cook together with vegetables, egg and finally topped up with fried anchovies or "ikan bilis". One of the traditional shop that has been operating since 1980 in Klang is located in Berkeley. 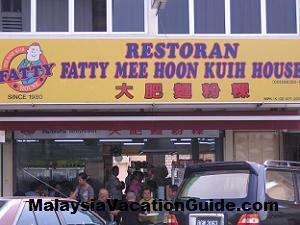 The name of the shop is Fatty Mee Hoon Kuih House and it operates from 10am to 10:30pm daily. A big bowl with egg costs RM4.00 and barley drink costs RM1. This shop is usually crowded during lunch hours hence it is not a good idea to go during this time. The demand for it has caused another shop at the same row selling the same food but it is not as crowded as this shop. 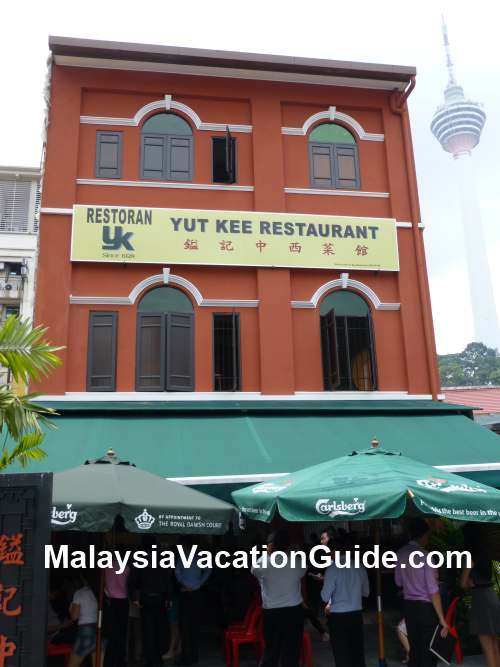 The famous Fatty Mee Hoon Kuih House Restaurant. 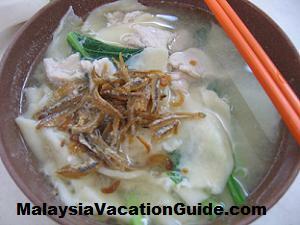 The mee hoon kuih soup with egg, vegetables and fried anchovies. The GPS coordinates of this shop is N03° 03.498' E101° 27.833'. If you are driving, use the Federal Highway and head towards Klang. Keep left to Berkeley before Klang town and turn 3 O'Clock at the roundabout. Go straight and you will pass by Holy Redeemer Catholic Church to your left. Turn right after the church and you should be able to find the shop. 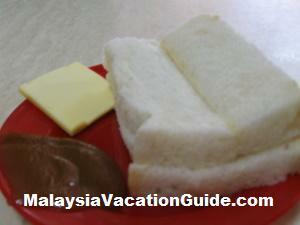 If you want to try toasted bread with coffee, the Chong Kok Kopitiam is the shop to go. 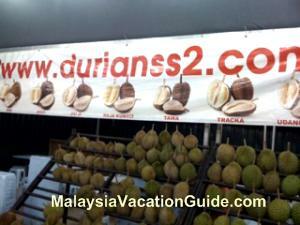 This shop at Jalan Stesen is located less than 100 meters away from the Klang Komuter Train Station. Toasted bread with butter and kaya is a popular meal here. Other variation is steamed bread with kaya and butter. 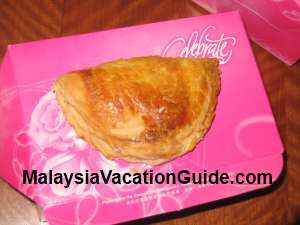 If you are still hungry, you may want to try the "nasi lemak" and "karipap". The black coffee is served here as well. The coffee shop at Jalan Stesen. The steam bread with butter and kaya. 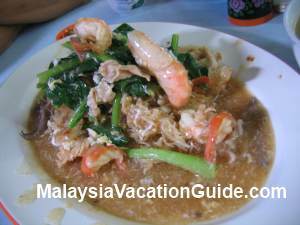 Klang is popular with bak kut teh, a Chinese soup where pork that is cooked with herbs. This restaurant at Jalan Besar within minutes away from Klang Train Station is also known as Bak Kut Teh Under The Klang Bridge. 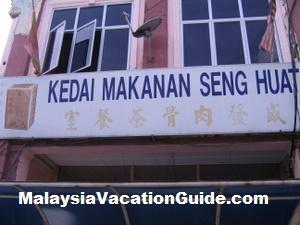 It is named so for the simple reason that the shop is located beside the Tengku Musaeddin Bridge. This shop is crowded during lunch hour. Days off is on the 1st and 15th day of the Chinese Lunar Calendar. The Restaurant Under The Klang Bridge. Head for Cendol Klang for dessert after your meal or have rojak with cendol at this shop which has been in operation since 1972. It can be quite busy during lunch hours. A normal cendol costs about RM1.70 and with "pulut" rice about RM2.20, all served in stainless steel bowls and spoons. The GPS Coordinates of the shop is N03° 02.917' E101° 26.726'. A bowl of cendol from Cendol Klang. The shop located at the town centre. If you are looking for cakes, the Regent Confectionary is popular with pandan layer cake. 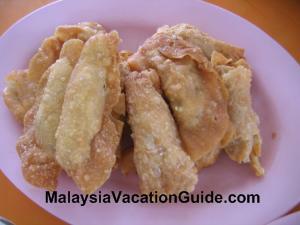 Other snacks such as peanut biscuits, "heang pneah" and tambun biscuits are also available here. 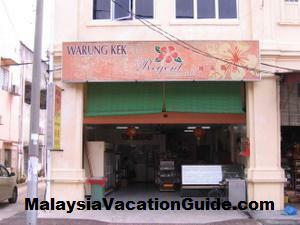 This shop is located at Jalan Raya Timor, about 10 minutes walk away from the Klang Train Station. 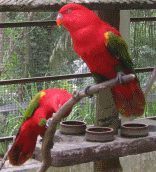 It is open daily. The bakery shop at Jalan Raya Timor. 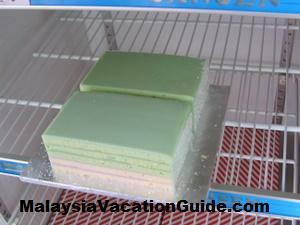 The famous pandan layer cake is available here. There are a few good Bak Kut Teh Restaurants at Taman Intan, Klang. 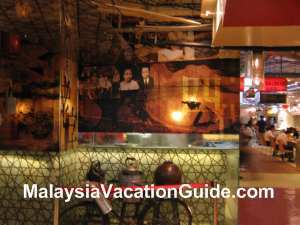 Learn more about the Selangor Sultanate history at this gallery located in Klang.